Build your collection of ChloBo bracelets and never be without a touch of exotic glamour in your wardrobe! It's no surprise that style icons like Cheryl Cole and Coleen Rooney have been spotted wearing stacks of ChloBo jewellery - inspired by the designer Chloe Moss' travels around the beautiful island of Bali, and made with high-quality Balinese Silver, these bracelets are gorgeous, edgy, contemporary and oh so attention grabbing! 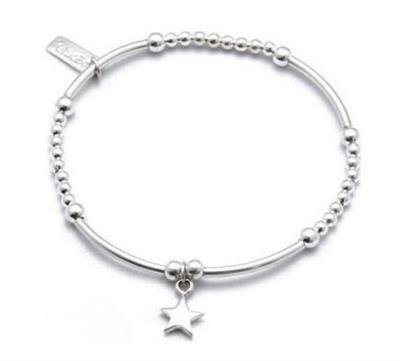 This bracelet features a mixture of round and noodle Silver beads, with a mini star charm attached to add movement, sparkle and personality. Combine with your favourite ChloBo pieces for a look that's completely yours and completely on-trend!